Lexus aftersales consultants are being given a taste of the luxury living enjoyed by their customers. All in the name of good business development, staff from Lexus Centres across the country are being pampered at top class hotels as part of a programme to raise customer care to an even higher level: experiencing for themselves the kind of quality and service their clients enjoy and expect, will help them hone their own customer care skills. 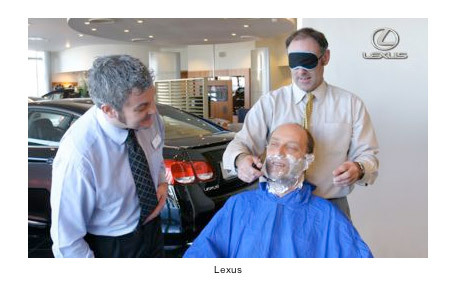 The hotel visits are not just about the high-life, however, as the training sessions include “trust” scenarios, for example where one person is talked through the procedure for shaving a blindfolded colleague with what they believe to be a cutthroat razor. This relates to the way in which new customers need to be introduced step-by-step to the aftersales procedure, without, of course, any risk of blood-letting. For a company already renowned for its customer service, Lexus knows better than to rest on its previous success, and what better way to improve than to have sales consultants cutting at each other’s throats?